A historic bilateral ceasefire declared last Thursday between the Colombian government and the country’s oldest and largest guerilla army — the FARC (Revolutionary Armed Forces of Colombia) — is the fifth and final step in a long and meandering peace process that is being heralded as the turning point of Colombia’s transition into a ‘post-conflict’ nation. Backsliding, compromised values and broken promises on both sides, as well as numerous delegations to Cuba with little foreseeable progress for the Colombian public, almost doomed negotiations to failure. In January of 2013, during a fleeting two month long unilateral ceasefire enforced by the FARC and largely respected by the Colombian military, I traveled with a grassroots human rights organization to meet with some of the country’s most persecuted groups during the 52 year armed conflict: Afro-Colombians in the port city of Buenaventura — many who still maintained individual ethno-tribal African identities — and Indigenous and campesino groups of the vast war-torn planes of Valle de Cauca. The highly disturbing wealth disparity on display in the port city of Buenaventura was the pinnacle of a vague yet quaking aura of instability that seemed to permeate the entire country. The population was on edge. An almost tangible undercurrent of fear rumbles through the collective ambience of this city, which has been unashamedly controlled by drug-trafficking cartels since the 1994 privatization of the Colombian Port Authority. At the time of our delegation’s visit, Buenaventura residents lived under a UN advised curfew of 4:00 p.m, but no one followed it. Mysterious armed actors, who seemingly unaffiliated with law-enforcement and practically sporting full riot gear, roamed the streets in bands, posturing with their weapons from open-air jeeps or semi-trucks with rear doors ajar. The curfew ultimately – if unintentionally – seemed to function as a default excuse to put the entire city in a reticent state of martial law between mid-afternoon and dawn the next morning. Union leaders, many of them Afro-Colombian, were routinely targeted with violent intimidation tactics and systematic attempts to obstruct any sign of collective organizing. Post-privatization, port workers in Buenaventura are set up to take the fall for any drugs discovered in shipping contents. This neoliberal trump card conveniently allows stakeholders to socialize risks while privatizing profits; while simultaneously allowing management to quickly weed out any potential whistleblowers. During another memorable leg of the journey, we traveled deep into the Valle de Cauca and converged with a large gathering of coca farmers, some traveling for days to receive us. Their journey was relatively perilous; despite the ‘official ceasefire’, FARC and several ‘unofficial’ government paramilitary groups still indefatigably roamed the territories, taking particular note of anyone remotely positioned to get in their way. Indigenous groups in the region tended to suffer violence and intimidation tactics from all sides. At times, I became extremely uncomfortable with the situation, skeptical of our group leadership, and wondering — often aloud — whether anyone had really conducted a comprehensive cost-benefit analysis regarding the potential impact(s) our presence could have there. I worried any affiliation with a random group of Americans — the country who exported the infamous ‘Plan Colombia’ to the region — could make even the most innocuous of individuals a target. The billions of dollars of military aid the U.S. government has provided under ‘Plan Colombia’ coincided with an explosion of human rights abuses committed by the Colombian army as well as the reactionary FARC. Resentment still runs high towards all groups of armed actors in the countryside. Nevertheless, I became exceedingly aware of a willful desire on the farmers’ part to pass on information so, at the very least, we could serve as ambassadors by carrying their story north to the United States. We were a motley crew of Americans from (relatively) different backgrounds and lived experiences who were (in retrospect, somewhat selfishly) there to learn, to pull back the curtain of drug war propaganda shopped around to the general public by mainstream media circuits and civic institutions. We were no sort of heroes, and we had no answers. Yet, compassion was in great demand and we brought an inexhaustible supply. In their desperate circumstance, the Indigenous campesino collective projected an image onto us as a conduit to a Super Power — the closest they would ever get to addressing the U.S. government — an authoritative and murderous abstract entity that constantly lurked just out of sight on the horizon of their lives, subsidizing wave after wave of state-sponsored terror. However, perhaps the real appeal to be made at this level is to the American taxpayers, who — in a spirit of near unmitigated ignorance — are actually financing the destruction of traditional Indigenous biocultural heritage across Colombia. 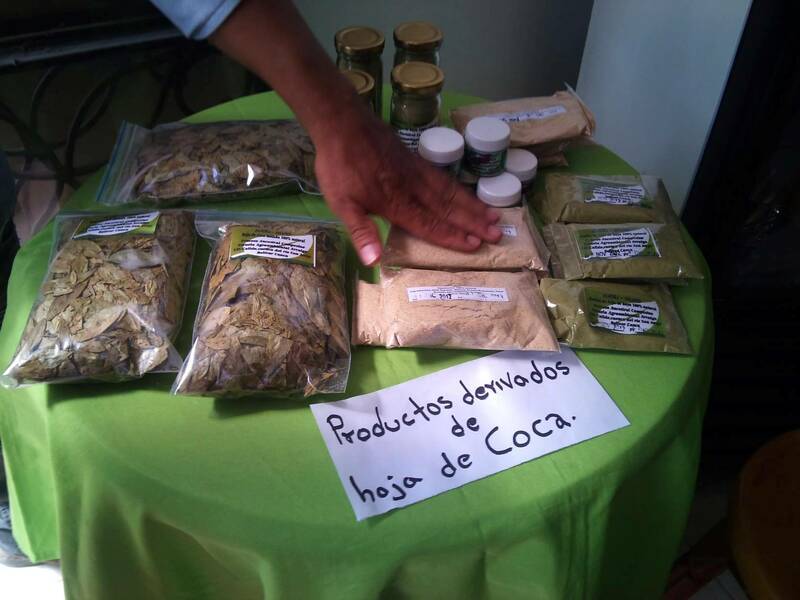 On the front lines of the drug war, the ancient Indigenous practices and traditional livelihoods constructed around the use of the coca plant are constantly and progressively under threat. Though by some categorical rhetoric, the coca farmers are mostly labeled campesinos, we found a people wholly in touch with their Indigenous roots and identities, who relayed stories of how their families had cultivated coca crops for thousands of years; a traditional practice on traditional land. Enthusiastically touting the nutritional benefits, they served us a delicious array of foods made from coca flour, along with all the coca tea we could drink. Despite the reputation the leaf has garnered due to the appropriation and exploitation of its chemical makeup to produce cocaine — the street drug that has become so popular on Wall Street — traditional use does not deliver any kind of rush or high. Having consumed several cups of tea, I can vouch for this personally: a kinder, gentler alternative to coffee, the coca tea alleviated my general travel fatigue and provided me with relief from a nagging stomach ache. And I didn’t experience any negative effects like feelings of jitteriness or an energy crash later in the day. Coca proponents further explained — while providing edible evidence of — how it was a veritable staple crop of their ancient culture, much like corn to Native Americans in the United States, our group later mused. The coca farmers raged with concern over how U.S. government-sponsored ‘Plan Colombia’ — which oversaw, and financed, the chemical warfare waged against the ancestral coca-plant, destroying large swathes of traditional farmland and communities with cancer-causing glyphosate — didn’t just mean a loss of livelihood, it meant a loss of basic sustenance; families often go to bed hungry after it is eradicated from their region. Beyond the unjustifiable loss of an ancient culture and tradition, in many cases injudicious drug war tactics also resulted in the loss of health, the loss of homes, and with little to no less frequency, the loss of lives. Back in la ciudad de Bogota, we were able to gain audience with former Colombian attorney general, Gustavo de Greiff Restrepo. Erudite and pleasant in demeanor, he still emoted the undertones of an exhausted erstwhile idealist who had dared take on the role of David in a David and Goliath battle of intercontinental proportions — Goliath being the ill-founded US drug war policy in the region. Explaining the economics of the situation, he asserted how the coca farmers we met only made a fraction of a percent of the profits from any cocaine eventually produced. These were not a people with a personal investment in the cocaine trade; they were indeed merely carrying on the traditions of their Indigenous ancestors — and adapting to the small range of choices available to them as this culture became increasingly appropriated, commodified, and commercialized in pace with a larger globalization. He went on to explain how during his tenure as attorney general, he had seen the light regarding drug regulation and come to the firm realization that legalization was the only way out of the unremitting crisis. Only by bringing the activity completely above ground could it be targeted as the public health problem it inherently is — the climate of violence, the trail of addiction, not to mention the environmental destruction of failed eradication tactics involving chemicals which render farmland helplessly barren in the wake. He spoke of how the Colombian president at the time cried — literal tears — to him behind closed doors, lamenting how Colombia was so dependent on U.S. funding that his hands were completely tied to diverge from the fault-ridden course. As it stands today, Colombia is being celebrated — and rightfully so — for a hard won journey into more harmonious times. Yet beyond the longstanding and antiquated battle with FARC – based largely on inequality in the countryside and agrarian reform — there is another battle for subsistence farmers of Indigenous heritage still looming on the horizon. As Colombia has once again overtaken Peru as the most prolific supplier of cocaine, it stands to be a most auspicious time to admit the failure of — and close the chapter on — the notorious ‘Plan Colombia’ / drug war era policy approach, entirely. As far as regional precedents, nearby Indigenous-led Bolivia has managed to experience success with alternatives to drug war-themed eradication efforts – shifting to a more sustainable agricultural economy not overly dependent on coca, while maintaining space for traditional Indigenous production and use. As many people are aware, coca is also one of the most popular treatments for travelers experiencing altitude sickness while visiting Bolivia for business or tourism. As with hemp, there are incalculable ways coca crops can be diverted to alternative uses, and legal products, aimed at national and international trade. If nothing but in a spirit of reparations for the disastrous appropriation and commodification of Indigenous coca culture, it would make sense to allow those with the strongest traditions and knowledge to stake out a new autonomy towards healing past abuse of this sacred biocultural heritage. Colombia is poised to serve as a post-conflict role model, by rebuilding its fragmented sociocultural landscape in a spirit of respect for Indigenous autonomy, and the precious biocultural heritage that coca inherently represents within it.